Hey Sugar Fix Followers! We had another busy week at The Loft!! And while the weather this past week has been all kinds of crazy, we’re holding out that April showers really will bring May flowers! Come on, spring! We’re READY!! 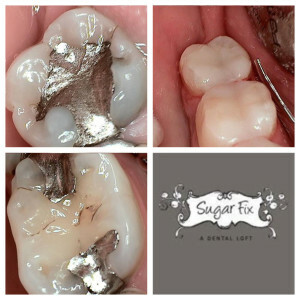 This week at The Loft we were busy with patients by turning old silver fillings into our amazing Cerec restorations! We turned old silver, black, and blue looking fillings into sparkling, white, porcelain gems! Check out the before and afters below to see how great they turned out! The anatomy added to the teeth make them blend right in and look so natural! This way, when our patients smile and laugh, all you can see are the gorgeous restorations and not the silver fillings! An added bonus for the patient is the peace of mind that the teeth are very strong now and are less likely to fracture. Several patients came in with broken teeth that had silver fillings in them before. The filling is usually too large for the tooth and a stronger material is needed. Before we had the cerec machine, we had to send out to a lab for these restorations to be made and the wait time was 2 weeks! Now, we are able to do it all in one day! Everyone LOVES this technology! Old silver filling vs new porcelain onlay! Two new gorgeous cerec teeth! Besides the Cerec restorations that kept us busy this week, we had a patient that wanted whitening for some spring weddings coming up! 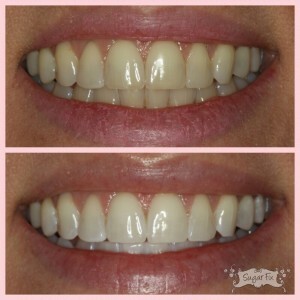 She opted for the Zoom whitening with take home trays to do touch ups afterwards. Her results were great and she was happy to have a brighter smile for photos as well as seeing friends and family. The at-home trays can be used every few weeks or every month for touch-ups. Depending on your particular staining habits (like coffee and red wine to name a few culprits! ), you may want to whiten more often. We suggest to whiten for a few days before any events to make your teeth really POP!! Before and after of Zoom! Our new advertising campaign started this week! We have new El-stop posters up, as well as a new poster in our front window. Plus, we changed out all of our social media headers! We’re really “thinking spring” in this new campaign, and we hope you love it just as much as we do! We would be thrilled if you captured a picture of yourself with our new campaign- send us your selfies, we’d love to post them onto our social media sites! In keeping with this spring-thinking, we even had the flower boxes changed in front of The Loft…all in hopes to make Chicago feel more spring-like! We hope you enjoy all of our spring-upgrades! 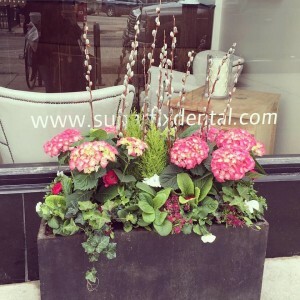 Spring has sprung at Sugar Fix Dental Loft! So, until next week…here’s wishing for sunshine and birds chirping in our near future!! Keep smiling & remember, if you’re thinking your smile is ready for a spring-upgrade, give us a call and we’ll make everything look & feel better!